Participants will experience what it means to live in a culture of peace, mutual respect and democracy during the Peacebuilder Summit, learning dialogue skills and circle practice. The entire five days of living, eating, learning, dialoging and celebration together in a safe, positive environment, sitting in circles together (the ultimate embodiment of equality) will be a form of transformative dialogue/learning (a process of getting beyond gaining factual knowledge alone to also become changed or ‘transformed’ by what one learns and experiences). Learners will be engaged in critical reflection on their experiences, leading to a transformation of perspective. They will also have many experiences of different identity groups interacting with each other to discover that pre-existing negative stereotypes are in fact groundless and ‘the others’ have positive qualities. The safety in the circle will empower all voices to be heard. Each day will begin and end with reflective practices of silence, focused conversation with a partner, and facilitated debriefing with the whole circle. Large Group Dialogue and Action Planning / Open Space Technology: This internationally used model, based on the African marketplace and circle, will create the opportunity for all participants to raise the issues that they consider to be important, to take responsibility for their concerns and needs, and to engage in action oriented dialogue with the group. It has been successfully used even among people who see each other as ‘the enemy.’ Participants set the agenda for small breakout groups and self organize into the conversations of their choice. In doing so they discover new ways of working cooperatively, while expressing their own perspectives, and taking responsibility for what they care about. Open Space provides people with experiences of genuine empowerment and the ability to achieve a high degree of collaboration around complex issues. Participants will learn how to facilitate these large group processes through their participation, supplemented by an instruction guide we will give them. They will be able to bring these processes back to their home community to empower their communities to find solutions to their challenges and to resolve their conflicts nonviolently. Cultural and Evening Activities: Participants will engage in cultural activities that increase connectedness and lead to an appreciation of ethnic tradition. Activities include singing, cooking and dancing together, sharing, and making meaning explicit (exchanging world views, traditional myths, storytelling, etc.). Closing Ceremonies and Rituals: The Peacebuilder Teams will be supported and encouraged to make clear plans for their next steps and to publicly declare their intentions. To further recognition and interconnectedness, closing rituals will include offering each other appreciation. And each group’s traditions will be honored in the closing ceremonies, which will be co-designed with the participants. 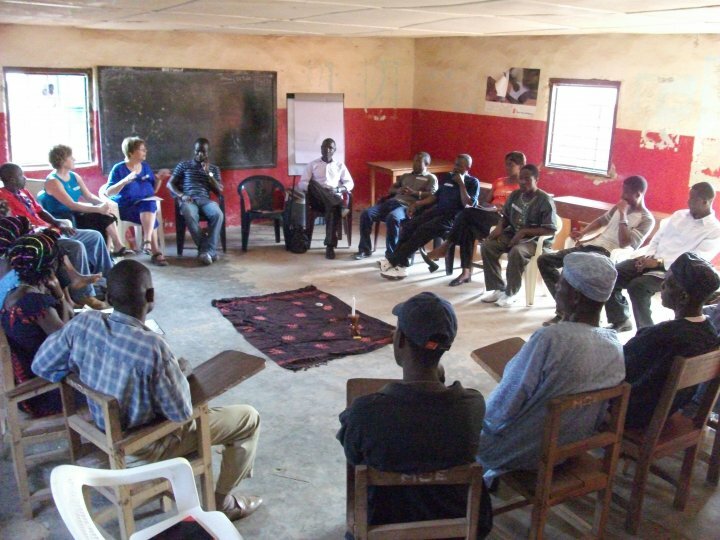 Small Community Meetings: Local LPI staff will support the Peacebuilders in convening and facilitating these meetings. They will gather and record comments, inputs and suggestions from all participants to share in planning future Summit and to measure outcomes (see Evaluation Section). When the Peacebuilders return to their home communities, they will gather groups where everyone’s voice can be heard and where they share their learnings from the National Summit. The greater safety offered by smaller groups will allow concerns, about challenging issues to surface, such as power and authority, repatriation of refugees, gender, age, and erosion of respect for elders. The group will be invited to explore perceptions about each other’s cultural, gender, religious, traditional and other differences. They will discuss what it would take to move towards reconciliation and forgiveness of ‘The Other’ and begin to identify what is needed within the community to build peace, respect and hope. They will support each other in integrating practices of Compassionate Listening, conflict resolution, and healing in their families and communities. Town Hall Meetings (post summit): The Peacebuilder Teams will convene a Town Hall meeting to share what they have learned and discussed in the meetings, as well as to encourage the community to explore the concerns they have raised. They will explore how they can work together within the community and with other ethnic groups in Liberia, to create the future they want for themselves and their children. They may use the World Café and Open Space formats or other traditional processes. Peacebuilders who organize a Town Hall will contact our local staff for support at the event and for a small stipend to help cover costs.